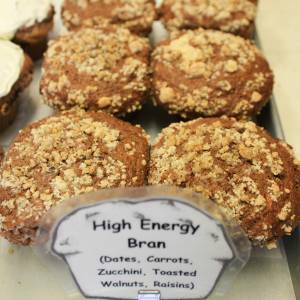 More like high voltage bran! Dates! Carrots! Zucchini! Toasted Walnuts! Raisins! Bran! You can’t even talk about it without energy! The muffin made from solar powered goodies, is used by NASA and is the official muffin of the French-Canadian Olympic Team (F-COT). Frank’s great-great uncle found the recipe while searching for the Fountain of Youth, only to realize after a hundred years of eating it that it was the secret to eternal life! Tough luck Ponce de Leon.